Garden fairies here. We are garden fairies and we do not care that Carol made this a combined "wordless" and "wildflower" post just because Wildflower Wednesday occurs on the same day of the week as Wordless Wednesday. We've got something to say about Loraine Sunshine. Yes, we do. See all those green leaves behind Loraine's variegated leaves? Do you see them? Those are Loraine's offspring, her seedlings. They are solid green. That's what happens when you get a fancy all-dressed up perennial wildflower like Loraine. She can self sow and sometimes you get all green leaves and sometimes you get variegated leaves. It just depends. What does it depend on? Us garden fairies, of course. You think it is easy to paint those leaves all variegated like that? Well, you just try it some time before you judge us. And don't be all sloppy about it. Paint them nice and even and perfect the way Sundrop Leafpainter does. She's one of the best leaf painters around and always paints the Heliopsis herself, which is why some are variegated and some are green. Heliopsis helianthoides is a native wildflower which has bright yellow daisy-like flowers and can grow up to three feet tall. It's commonly called ox-eye daisy and is hardy in USDA Hardiness zones 3 - 9. It is a good self-sower but can be kept in check by removing spent blooms before they go to seed. The variegated variety 'Helhan' is sold as Loraine Sunshine. It can also self-sow about the garden, producing both variegated and green seedlings. I grow it for the beautiful foliage and do try to remember to remove spent blooms. If you don't, well, you'll have a lot of Heliopsis to share with others. To read about other wildflowers, visit Gail at Clay and Limestone, our hostess for Wildflower Wednesday. I love ox-eye daisy. I love to see the flowers early in the Spring. I do deadhead, because it is a small space. 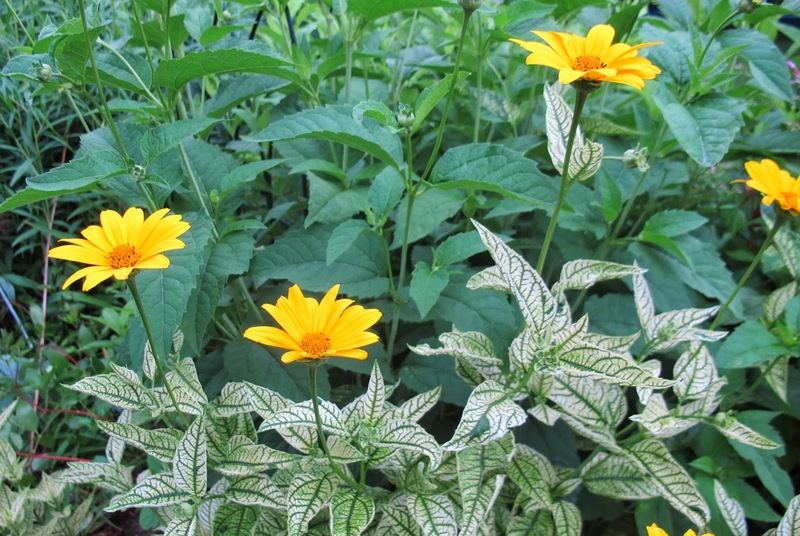 I love this heliopsis too but it did self sow with solid green and variegated leaves....very interesting! I'm sitting here in my dining room looking out on the garden, and what do I spy, but a Heliopsis with bright yellow flowers. I never planted a sunflower with all green leaves, but I did plant "Lorraine Sunshine" with variegated leaves. Your post has cleared up the mystery. I would not have known about this phenomenon but for your wisdom. I enjoy your blog very much. Keep up the good work. My garden has Loraine Sunshine as well. Like yours she is very good at making babies and some of hers are variegated and others are not. She was a gift from a friend's garden and I didn't know her name so, thank you for that! I was enamoured of this plant when you featured it before, so I looked for seeds but only found a similar daisy from T&M, last year when I grew it I planted it in the ground and it didn't manage to bloom by fall, so this year I started more and planted one in a planter so I can bring it in this fall, so I hope to see it bloom. The foliage alone is gorgeous! Ah, so that's how those variegated leaves came about! I don't have any Heliopsis in my own garden, but we do have 'Lorraine' in the nursing home garden where I volunteer. She is such a cheerful bloomer all summer long.